Global competition and the unpredictability of the world economy have made strict cost management essential, and getting the result you want from Business-to-Business (B2B) Negotiations is now a priority for every corporation and organization. B2B Negotiations have become increasingly challenging as the pressure on Negotiation Teams increases, and the use of Psychological Warfare by buying organizations, whether tactics are ethical or unethical, has become commonplace. On the contrary, it seems that selling organizations are often not trained to respond to Psychological Warfare or to make proper use of it themselves. This puts them at a significant disadvantage and may even lead to the failure of the Negotiation Process, while a mutually beneficial Agreement could have been reached. Are you involved in B2B Negotiations? Make sure that you learn to identify and to ward off the Other Negotiating Party’s use of Psychological Warfare. Furthermore, make sure that you learn to use the ethical tactics of Psychological Warfare to ensure maximum leverage of your Negotiation Power. 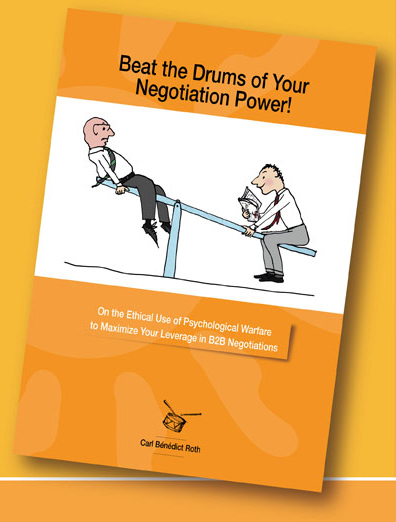 In other words, make sure that you learn to Beat the Drums of Your Negotiation Power! In this book, the author presents a new, process-oriented and pragmatic approach to B2B Negotiation, which guides you from the development of your Negotiation Strategy via the Negotiation Dance to the Post-Negotiation Review. A further innovation of this book is the emphasis which the author puts on Psychological Warfare, from an understanding of the underlying mechanisms to the discussion of ethical and unethical tactics during B2B Negotiations. The author also uses a new approach to help you sharpen your skills in B2B Negotiation – the theoretical framework is embedded in a compelling business case. This makes the learning of B2B Negotiation actionable and entertaining. Kan Gane is a Ghost Negotiator for exceptionally tough cases. Join him in his new B2B Negotiation, at the interface between the IT and fashion industries!